As far as big cities go, it doesn’t get much better than Chicago. Museums, foodie scenes, music and natural landmarks fill the city with much more accessibility than those other towns on the coasts. But if you’re craving a little small town charm with your culture, you can also have that, just 20 minutes west of the downtown Chicago in historic Oak Park, Illinois. You can hop the train from downtown to get to Oak Park but for a more relaxing exploration, book a stay at Harvey House Bed & Breakfast. Located in the middle of the historic district and offering elegant suites that give an authentic feel of Oak Park life, the 1890s era home is the perfect headquarters for strolling all around the village. 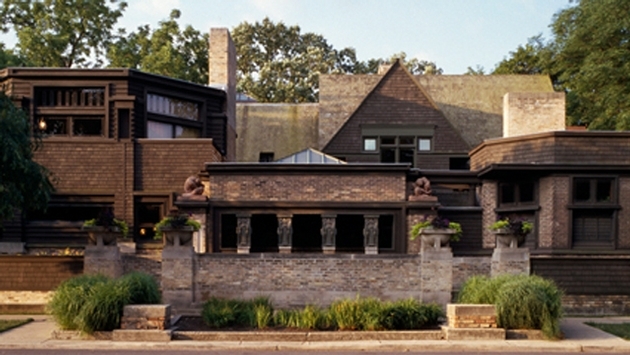 Enjoy a gourmet breakfast and head out to the ultimate Oak Park experience-- the Frank Lloyd Wright Home & Studio. Even if you’re not into architecture, a tour of the architect’s home and studio supplies fascinating insight into his personality and inspiration. A 45-minute Historic Neighborhood Walking Tour is also a must, the self-guided tour takes you through five blocks of Wright’s masterpieces, For super fans, the three-hour Wright Around Oak Park interpretive tour gives in-depth info about his life and work. After seeing the historic district, walk a little south to New Rebozo restaurant for a sumptuous Saturday lunch. The owner and chef Paco serves up authentic and flavorful Mexican cuisine, including 21 different kinds of moles with a vibrantly decorated backdrop. Frank Lloyd Wright claims a major visual presence in Oak Park but Ernest Hemingway commands the essence. Oak Park was where Hemingway was born, raised and educated. The village helped shape his personality and his perspective of the world. Visit the Ernest Hemingway Museum and Birthplace Home to dive into the intriguing and bizarre life of one of the country’s most influential writers. After a proper visit with Papa, check out the music lover’s haven, Fitzgerald’s. Technically a few blocks over the Oak Park border in Berwyn, Fitzgerald’s is a former roadhouse that showcases blues and roots music. It’s beloved by Oak Parker’s and Chicago folks alike. Take in some live music and top the night off at Novo, a chic restaurant and bar that feature’s some of Oak Park’s most innovative drinks and plates. Noted chef Corey Lamb dishes up enticing creations like pork belly with house made kimchee and pear and fig flatbread. Toast the night with a spicy Novo toddy and soak up your Oak Park adventure.